The Lake at Woodlawn House, October 1865, with the White Bridge in the background. The lake was one of the main landscape features of Woodlawn House. This was a man-made structure, fed by the rivers of the area. A number of weirs were located along the rivers and streams to allow water feed into the lake. The demesne lake was photographed in the 1860’s by the Dillon family. Here we see the ladies and gentlemen strolling alongside this fabulous water feature, and sitting enjoying the view. The White Bridge is visible in the distance. One would also imagine the lake was used for recreation purposes. 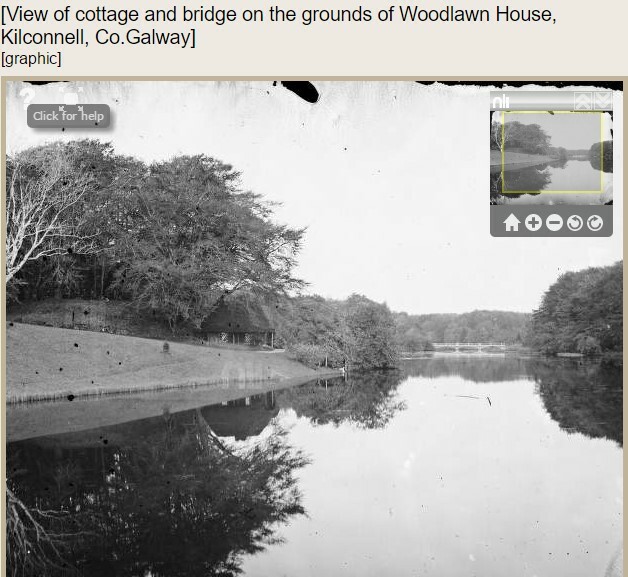 As well as being a prominent landscape feature the lake was also a food source for Woodlawn House. Trout and haddock appeared on recipes of the big house. In the winter ice was collected and brought to the ice house. This ice would then be used to aid in storage of meats, game and poultry in the ice house. The ice would also be used for drinks on the lawn in the hot Summer days. 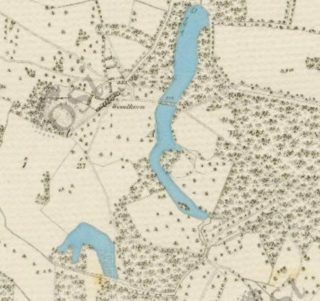 The fresh water from the lake was piped throughout the demesne. A pump was located under an arch of the grand bridge which supplied the mill, gardens, laundry room, and gamekeepers house with all the fresh water required to maintain the industry.